Can Your Lovable Pup Help Your Child Grow Educationally? Last month we talked about the value of a child with special needs having a service dog with them in the classroom at all times. We also talked about some of the pro’s and con’s for the child without disabilities. But what if there was an area that your child struggled with that maybe wasn’t severe enough to require the services of a full time, highly skilled and trained animal? Can your every-day run-of-the-mill pup still be able to help your child in educational ways? In many cases….yes!! As adults, we all have our strengths and weaknesses, just as children do! The difference is, our weaknesses are not often exposed, all day, every day, to our peers. Imagine how difficult it would be if you worked in an office, with the same people right next to you, no cubicles or dividers between you and them, and part of your job was a task that you had to perform daily, that you really struggled with…. Yet it seemed to come so easily and naturally to all those around you. How frustrating would that be? How embarrassing? Sure, you could ask for help; but that would get old, really fast…. Especially if it was something that you just ‘didn’t get’. As an adult, I have learned to kind of make light of it (I tell my clients, “Boy, I wish my talent with the dogs transferred to other areas of my life, like Math and a sense of direction!) For me, that statement always lessens the embarrassment when writing out a receipt for a client, when I cannot do the simple math to add it up in my head…. And forget about adding on the tax! But after that statement, I can grab a calculator. Tools like that aren’t always available when you’re a kid. And let’s face it…. School is a tough place at times! Kids can be horrible…. Especially once they see a weakness in another child…. That child can suddenly become an easy target for taunting and bullying! And in that kind of atmosphere is it any wonder the child will become more insecure and not want to ask for help? On this site are also numerous ‘how to’ videos where they show you what you can do if you would like to become a ‘R.E.A.D. owner/handler volunteer team’ in your area. But I want to simplify it a bit and mention a few things you can do to see if your own personal dog can accomplish this task for your child at home. I want to mention here that although the program itself is very familiar to me, the ins-and-outs of how it works were not, so this has been a wonderful learning experience for me as well! All of the tips and feedback I am going to give you are a culmination of my training skills and experiences, mixed with highlights from the many videos I have watched that came directly from this organization. As I mentioned before, I wanted to simplify this so that you can see if your dog is a good candidate to provide this service for your child, and if so, how to best accomplish this task. The ability to lie still for however long you choose to hold your reading ‘sessions’ (note: If your dog is not good at staying still for an hour at a clip, do not be discouraged and think this will not work for you. Try shorter durations.) This is important because we want to set up an atmosphere of a non-judgmental space for your child. If they are embarrassed already about their reading skills, or have ever been teased because of their reading difficulties, the dog getting up and walking away may be interpreted by your sensitive child as a form of rejection. A good “Touch” command. 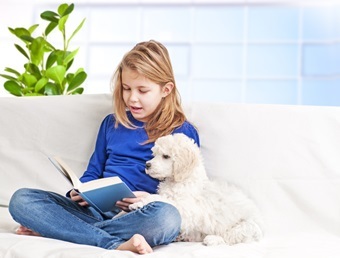 This is important because it helps your child to really feel like the dog is involved in the reading when your dog periodically ‘touches’ the page with their paw or nose. This task becomes especially valuable when your child comes to a word they are having difficulty with or do not understand. You can signal the dog to touch the page, and then say something like, “Fido is having trouble understanding what that word is. How about we look it up so we can explain it to him.” Again, this is a very non-judgmental way to help your child….. Similar to when child therapists use dolls to help children speak about difficult things without it being in the ‘first person’. A not-so easily distracted dog. This kind of goes hand in hand with the solid DOWN/STAY. It is very important because again, the last thing you want is your child sitting down to read with the dog, someone walks by, and the dog gets up and leaves. Again, we do not want to risk your child feeling not-important or rejected by the dog in any way, which can happen if the dog suddenly gets up and leaves. Part Two – what skills and tools do you personally need to work with the dog and your child? A non-perfectionist attitude (remember, we want to encourage, not discourage! So ITA recommends it is very important that you not get ‘bogged-down’ on mistakes and be careful of the way your correct them. Do not be over-exuberant in introducing this concept to your child. While this may be an exciting new venture, I encourage you to first work with your dog consistently when the child is not around until you are relatively comfortable that this will succeed. Again, we do not want to raise your child’s hopes, and risk them feeling like this is their failure if the dog is not appropriate for this task. A PLACE set up specifically for this task. A private room or corner can work. A place where there are no distractions such as people going by, phones ringing, TV’s on in the background, etc. In this space you can set out blankets, pillows, sleeping bags, a lamp, a bookshelf with plenty of books you will take on together…..whatever you would like that does not cause distractions, but will be a comfortable place for you, your child, and your dog to work in. Make sure this place always remains the same, and is SOLELY used for this specific task. Remember that dogs and children both respond well to familiarity and routines. If this place is only used for this purpose, your dog will always automatically know what to expect and how to behave while there. Plenty of children’s books. Make sure they are appropriate to where your child’s skills are at. You do not want to use material that is too advanced, causing frustration for them. At the same time, you do not want to use books they may see as ‘babyish’. It will insult their intelligence and possibly make them feel that you think they are stupid. While you know your child is not stupid, if they have been previously made to feel that way by other kids, the last thing you want is for them to believe you think that way of them! Also, when choosing your books for them and your ‘place,’ pick numerous books about subjects and topics they are interested in. For example, start off with books about dogs. So, you have now determined that you and your dog both have the skills needed to help your child, now it’s time for Part Three – very important – practice this consistently when your child is NOT around. Call the dog over to the ‘space’ you have created, get them into the DOWN/STAY, pull out a book, and start reading. The ITA also recommends adding a “LOOK” command to this. They state that it really helps your child to feel like the dog is very involved, and it is a simple task to teach!! Before calling your dog over to the space, insert small treats into numerous pages of the book. Every time you get to a page with a treat in it, you say the command “LOOK!” and allow the dog to take the treat from the book. This essentially conditions your dog to expect something good to be on the page and to use his nose to ‘look’ for it every time you say the word “Look”. But again, this must be accomplished before your child joins you in this. You want your child to believe the dog is really involved…. Not that the dog is looking for a treat or reward! To keep it light and fun, make a sign out of some of the more difficult words your child figured out and/or looked up during the week’s readings, and then plan a ‘treasure hunt’ trip to locate those items and label them with the sign your child made. Be willing to be silly with them! If the word was “Mother”, go along with it and wear the sign! Find and set aside some “special treats” – for your pup and for your child that they get to enjoy together. Anything that makes this a special time your child looks forward to. With both kids and dogs, there is no such thing as a ‘cookie-cutter’ way to learn! 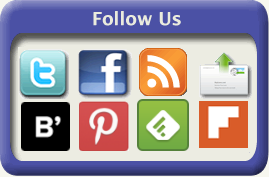 Each kid learns and responds differently… So if you have some additional ideas for us to try, please add them to the comments below!! We’d love to hear your ideas!